Today's students are often accused of not being ready for the workplace. Thanks to a special initiative run by Chiswick School, Chiswick Park-Enjoy Work and Spark!, the business education links charity, Year 10 at Chiswick have been learning how to prosper in the employment market. Last week they completed the WEX factor programme in which students have designed CVs and interviewed people from a range of careers. 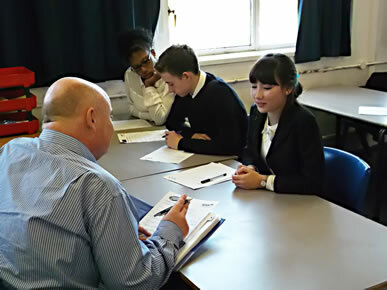 The main focus of the final day was on job interviews and 25 volunteers, including staff from a range of companies at Chiswick Business Park, other employers, parents and governors, put year 10 through their paces. Students arrived in school in their suits and business clothes. In the early part of the day students chose a ‘job’ to apply for. They were then given time to fill in an application form, research the company and find out about interview do's and don’ts. After break it was over to the volunteers to start the grilling. Every student was interviewed and received feedback from the local employer and their fellow students. Ellie Mcdade is a parent as well as Learning and Development manager for Concur Technologies. Despite the current trend driven by the DFE for schools to focus on solely on the academic, Ellie thinks schools can learn much from business;‘Great to get real life business people in to share their expertise,’ she said.